I find it remarkable how many non-familiar observers can quite easily spot the obvious spade in Islamic Finance practices, and call it a spade. However, for them to then completely ignore the issue that the source guidance (the final proclaimation and criterion; The Qur’an) never accepted any favourable position on RIBA (not interest, in any form, simple or compound), and that the deceit or falacy here should be put only at the doorstep of the commercial banking industry and its proponents who invented this fraud. There seems to be too much of an impression that underlying islamic principles are in someway contradictory; with one hand they oppose ‘interest’ and with the other hand, it is condoned in another form, under another name. This post will not go into the essential issue of what RIBA is (a more fuller all encompassing term) and not interest, however suffice to say, those who are of the above opinion have only a crass, superficial understanding of what they reject whilst at the same time, plenty of effort is put into unearthing great myths from other elements they wish to debunk – that is what I find odd. ….Many of the instruments Irfan discusses were sold by major banks that saw them as just another opportunity. This is not surprising: Governments and wealthy individuals wanted financing that complied with their religious requirements, and banks gave it to them…. Riba is not merely interest. Interest itself can take a numbers of forms, remove or change the English term, and the entire issue cannot simply be dismissed. For, whatever term is used, the actual application of this phenomena exposes the real use of Riba itself – a percentage number, applied to a principle amount, which continues to generate more and more of this result over time, a self feeding and ever-increasing to infinity. An earlier blog entry showing the ticking debt clocks for many nations public debt shows a profound example of this constantly increasing compound effect, it is a wonder how much more debt will be added to the total by the time you stop reading this piece? 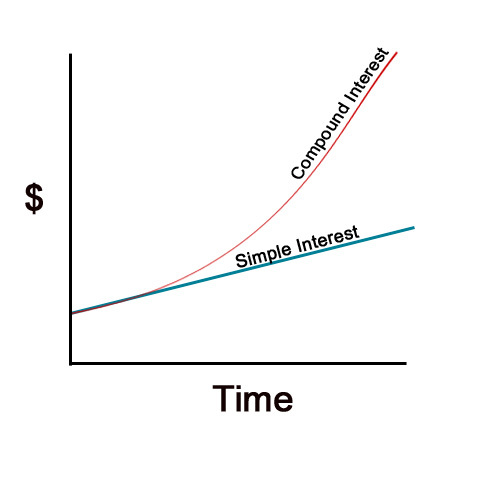 From the above link one can see clearly the overriding effect of compounding interest. Un-payable amounts, totals which need to be serviced regularly just to keep your head slightly above water. Whether it’s a third-world nation spending large proportions of its tiny revenue to make monthly repayments, to some of the strongest economic power houses of today, the debt burden will never disappear, that is not even the intention. The true purpose of debt is to show you can afford the repayments, and that the proportion of it is ‘reasonable’ as compared to the size of your economy. Why would a government choose to waste precious funds on clearing the principle debt? They can easily just generate higher inflation, and erode the value of the loan over time…..there are many tricks of this trade. Turning our attention to the Islamic Banking industry, their trick is to call interest ‘Rent’ or ‘Profit’. But see that both of these terms appear as percentage rates, applied to principle amounts….giving us clear instances of compounding, ie RIBA by any other name. The concept of compounding is evidently shown in such signs in the Qur’an, proving that Riba must be linked and concerned with avoiding this particular form which exacerbates the problems it causes. Expanding upon this, the natural order that has been created gives an element of entropy in everything. All things must decay at some rate and reach the end of their useful life. However the effect of compounding is directly opposite to this fact, it continues to grow and grow, never-ending. It goes well beyond the bounds set by our Maker. For further analysis of the Arabic terms in use in these verses, please refer to the RRMCR journals here. Note the links given to works by El-Diwany, Vadillo and others. The innovation (bida) of Islamic Financial Products continues apace. Next in line could potentially be sharia compliant student finance…how exactly these will be structured is still up for question, however the main point here is that it will give the industry another opportunity to confuse the issue and to pull the wool over the eyes of another core segment of the muslim demographic – students. I would personally suggest he begin some serious dialogue with the likes of Shaykh Umar Vadillo, Tarek El Diwany and/or Dr Mustafa Ali of the Bandung2 movement. Please listen to an informative audio discussion with Tarek El Diwany on the true nature of home finance within the so called ‘Islamic Finance’ industry in the context of money creation and debt based fiat money.